How have your buyers’ and influencers’ decision making shifted over the last year? As you finalize your marketing plans for 2019 and beyond, it can be helpful to understand the latest trends in inbound marketing. Based on input from more than 6,200 marketing and sales professionals, the latest HubSpot report on the State of Inbound identifies the current state of inbound marketing and sales strategies and operations to consider for the year ahead. For the past nine years, HubSpot, an inbound marketing and sales software platform, has tracked consumer habits in its annual business marketing and sales research report. Each year, thousands of global marketers and salespeople are asked about top priorities, challenges and the tactics they use to generate leads and increase sales. 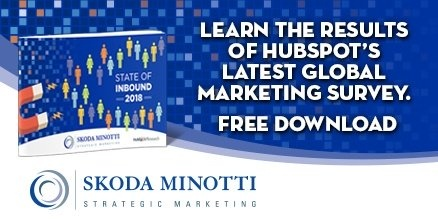 As a HubSpot Gold partner, Skoda Minotti Strategic Marketing is pleased to make the master report, State of Inbound 2018 available to you. The State of Inbound 2018 report provides a comprehensive, 64-page report that reveals what has changed with regard to how your clients and prospects want to receive content and how they want to access information. Prepare your business for the future of inbound marketing. Download the free State of Inbound 2018 report. Questions about how your business can keep up with changes in inbound marketing and sales? Skoda Minotti Strategic Marketing can help your business generate more leads and sales. Contact Bob Goricki, director of digital marketing, at 440-449-6800 or email Bob. This entry was posted in Digital Marketing, Mailchimp RSS, Strategic Marketing. Bookmark the permalink. Follow any comments here with the RSS feed for this post. Comments are closed, but you can leave a trackback: Trackback URL.